Getting ready for a fun Thursday, Friday, Saturday and Sunday. 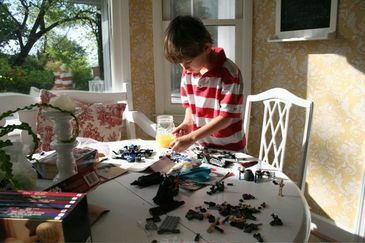 But of course, legos and orange juice start the day off right. 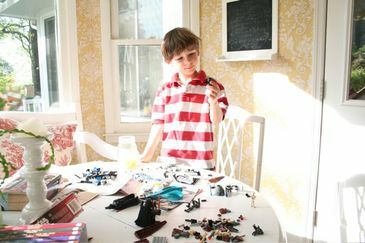 Today is Sam's Star Wars birthday party... yes, we're a little late with the party but it's nice to spread the celebrating. Today: Destination: Storyville Station and star wars party. Nana and Papa come into town. Yea! Friday: Sam's graduation from Kindergarten and his first official musical, "Down by the Creekbank". Yipee! Gee Gee and Da come into town! Yea! Mike and I celebrate 10 years of marriage on this day too! Hugs and kisses! Saturday: Uncle Brent and Aunt Carla, Katelyn and Callie come into town. Yipee! Lot's of celebrating going on in this house for the next few days... let's see, I envision cookie cakes, balloons, cupcakes ,presents, good food... Lots of laughter and hugs and love! All is quiet now for the morning, but soon the house will be buzzing!